I'm trying to write in English even if that language makes my head spin. 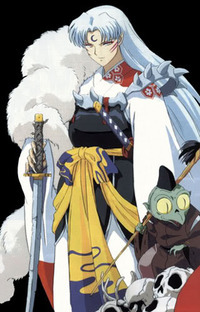 I support SessKag pairing because Inuyasha is too childlish for me. I write fanfiction because I'm too lazy to make out my own characters. If anyone of you followed my stories, I'm sorry to inform you I'm putting them on hiatus. But I also want to make it official - I have every intention on finishing them. Just recently, I learnt a bit about writing and I'm unhappy with the way I wrote previous stories. There's too much changes of view in one chapter, grammar mistakes, the plot is incoherent. I feel my stories need some addicional thinking. And no more two stories at one time! Until I'm done thinking I hope you'll enjoy story I wrote under new directions. Also, thank to my readers, my story Living with Darkness was nominated so I got this lovely banner :) Thank you guys! 'Never sleep with your boss' my story published on ff.net was nominated in 1st Quater Dokuga Awards in best drama and chapter 46 in best dark/horror category. Thank you! [COMPLETE] Seven days before Christmas Rin decide to take fate in her hands and grant herself perfect gift. Will she succeed? Everyone told Kagome, her too caring heart would bring her problems. And you know what? They were right! Now does anyone know how to train baby dragon? How To Train Your Dragon is soo good! Especially chap 7, that was intense! Can't wait for the next update! Thank you for you review in Nuts About You. And wow for having similar mind. I hope I can entertain you with my version. Thanks for taking the time to review Wishes and Windmills! . I'm glad you liked it and that I was able to give you a in-character Kagome to read . I completely agree she wouldn't give up on love easily. Thanks again! Thank you so much for your kind review of my story, "The Spirit of the Season". While writing bland technical reports is something I can do, creating fanfiction is something entirely new. I was definitely going for heartwarming and fluffy, so your review made me happy knowing that I did accomplish this. I'm glad you liked In Darkness No longer! As for Kagome's character, I think, for me at least, she's the easiest character to get a hold of - now Sesshoumaru... he's the challenge! Thank you! I'm happy that Now or Never did entertain you for a few minutes, lol! thanks! Glad you enjoyed it, I'll post chap2 soon. Feedback from Sophie: Okay =) I can't wait! I'm really glad to know I can help put with the stress and make it less by making you laugh - in today's world, we need all the help we can get! Feedback from Sophie: That's soo true!